The votes are in and our Mechanics Cooperative Bank customers have spoken! Photo Caption: The winners of the 2016 Let’s Keep it Local!® Community Grant Program receive their funds at Mechanics Cooperative Bank’s headquarters in Taunton, MA! (From left) Taunton Area Community Table Founder and working volunteer Michaeline Saladyga, Joseph T. Baptista Jr., President and CEO of Mechanics Cooperative Bank, Christina Kujampaa, Development Coordinator and Grant Writer for Homes for Our Troops in Taunton, and Jack Weldon, Executive Director of Saint Vincent’s Home, Mechanics Cooperative Bank would like to thank all of the organizations that participated and the winners for their efforts to promote and support this wonderful program! 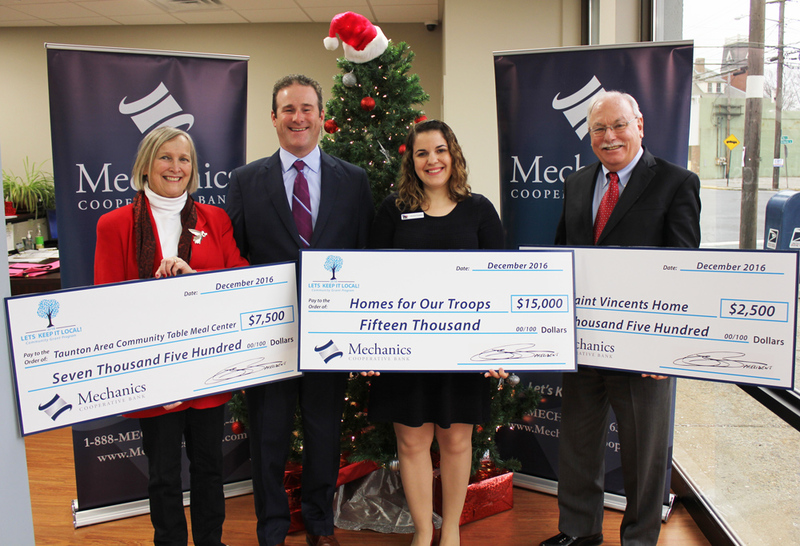 Taunton, MA: Mechanics Cooperative Bank, and their customers are proud to announce the winners of the 2nd Annual “Let’s Keep it Local!® Community Grant Program!” Mechanics Cooperative Bank is donating $25,000 to these local non-profit organizations who received the most votes from our customers! 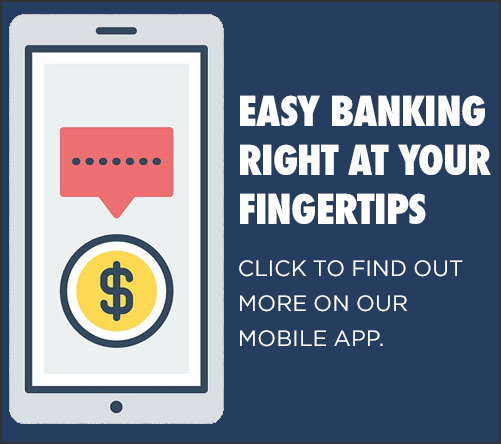 Voting began in February of this year and was open to all Mechanics Cooperative Bank customers that had a loan or deposit account with us. The process was both simple to vote and to get added to our non-profit list for consideration. Mechanics Cooperative Bank wanted as many local non-profit organizations included in our Community Grant Program as possible…so to get included on our list, each non-profit had to join us on social media. Any local non-profit that posted a photo to Facebook, Twitter or Instagram of their organization (employees, members, accountants, anyone!) using #LetsKeepitLocal and tagging Mechanics Cooperative Bank, was added to the list automatically! We wanted to see why these non-profit were the best and to get people talking about what they do and how they improve our community every day. Throughout the year as the Bank tracked votes and monitored updates they soon realized those organizations who have a strong social media presence and were actively participating in social media and promoting the Let’s Keep it Local!® Community Grant Program, were having more success. All three of our winning organizations were added to our list by posting a photo to social media and using the hashtag #LetsKeepitLocal; and then continued to promote the program and encourage support for their cause. 1st Place Winner ($15,000): Homes for Our Troops is a privately funded non-profit organization that builds mortgage-free, specially adapted homes for severely injured Veterans Post – 9/11, to enable them to rebuild their lives. Most of these Veterans have sustained injuries including amputations, paralysis, and/or severe traumatic brain injury (TBI). These homes restore some of the freedom and independence our Veterans sacrificed while defending our country, and enable them to focus on their family, recovery, and rebuilding their lives. HFOT builds these homes where the Veteran chooses to live, and continues a relationship with these Veterans after home delivery. Since 2004, Homes for Our Troops has built over 220 specially adapted homes nationwide. Their goal is to build a home for every Veteran who qualifies for a specially adapted home. Homes for Our Troops builds homes as a departure point for these Veterans to once again become highly productive members of society. Despite their life-altering injuries, many of our Veterans have embarked on new careers, completed college degrees, and started families. Empowered by the freedom a mortgage-free, and specially adapted home allows, these Veterans can now focus on their recovery and returning to their life’s work of serving others. Many have embraced their roles as motivational speakers, sharing their messages of persevering through tragedy with groups and classrooms around the country; others take to a national platform to promote awareness of veteran suicide, homelessness and post-traumatic stress disorder. Their incredible stories are the driving force for the work done at Homes for Our Troops. The main beneficiaries of these amazing homes built for free by Homes for Our Troops are severely injured, Post 9-11 Veterans and their families. Homes for Our Troops is located at 6 Main St, Taunton, MA 02780 and can be reached by calling the Taunton office at (508) 823-3300 or via the web at https://www.hfotusa.org/. Donations and volunteer information can be found online. 2nd Place Winner ($7,500): The Taunton Area Community Table is a volunteer, community-based meal center dedicated to providing delicious, healthy meals to individuals & families in a warm, friendly and safe atmosphere in an underserved section of Taunton. Forget what you think when you hear the words “soup kitchen.” Taunton Area Community Table aims to put a modern spin on what we think of as the traditional soup kitchen. They provide no charge, home-cooked meals to any guest who walks through our doors. There are no questions to answer, no forms to fill out, and most importantly, no judgement to endure. Their compassionate, friendly volunteers are dedicated to making the experience as comfortable as possible for all of their friends in the local Taunton Community. At Taunton Area Community Table they provide a personal touch that everyone can appreciate. Instead of waiting in line to sit at long, narrow tables, their guests are treated to a cafe-style setting. Tables seat 4 to 6 guests and all meals are served by our volunteers at their seats. They also feature a “Family Cafe” night on Thursdays. Focusing on children and families, Taunton Area Community Table serves kid-friendly meals and provides coloring books, crayons, and card games for after dinner entertainment. They also encourage children to bring any school work, crafts, art, drawings, tests scores of any kind and hang them on the community bulletin board. Taunton Area Community Table strives to not only provide our families a safe, warm place to go, but to make them feel like they are a part of a community where they are loved. Their volunteers take great care in getting to know the guests, just as you would expect from your favorite coffee shop. The co-founders and co-directors of Taunton Area Community Table are Michaeline Saladyga and Wendy Berry. After a combined 10 years’ experience running more traditional soup kitchens, Michaeline and Wendy decided to branch out and start their version of what they thought a soup kitchen should, and could be! Taunton Area Community Table is open Monday, Tuesday and Wednesday for breakfast and lunch from 10am until 1pm and on Thursday nights for dinner from 4:30pm until 7pm. Although anyone is welcome on Thursday, their focus is on kids and families that evening. They are located at 378 Bay Street in Taunton. If you have any questions, please call us at 508-386-3807 or visit http://www.tactmealcenter.org/ for more details on the wonderful work done at the Taunton Area Community Table. 3rd Place Winner ($2,500): Saint Vincent’s Home is a multi-service behavioral health, child- and family-serving organization with program sites in Fall River and Plymouth in addition to providing life skills for older adolescents. They are accredited by the Council on Accreditation, fully licensed by the MA Departments of Public Health and Early Education and Care, and fully approved by the MA Department of Elementary and Secondary Education. Staff provides residential and day school education for middle and high school students, direct care, in-home and community-based services, outpatient behavioral health, residential and group living support, and many forms of support and stabilization for families. For 130 years, Saint Vincent’s has been working with children and families to preserve hope. These funds will be used to purchase holiday gifts for many of the local children in our care that don’t have a family to celebrate with. These funds will provide a small piece of hope and joy to children that are in desperate need of love and support.